When I was a child, I used to love colouring books, pencil crayons and felt tip pens. I used to have a thick princess type colouring book at my grandparents that was always my favourite. Since the idea of adult colouring books came into being, I have to admit that I wanted to get me some. The designs were so much more intricate. I thought that the fact I loved colouring as a child, I would love colouring now I’m 28 years old. However, it was a while since I actually went out of my way to buy myself my first book. 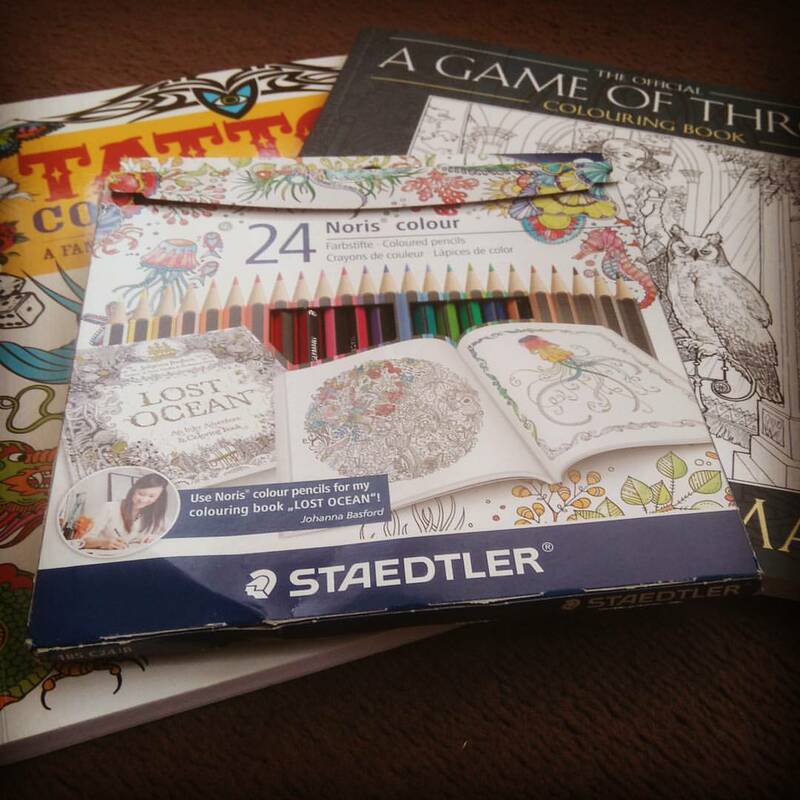 The first selection that I brought was a tattoo colouring book, the Game Of Thrones colouring book and a set of Staedtler Noris Colour Exclusive Johanna Basford colouring pencils from Amazon. I coloured a few small images from the tattoo colouring book, but I haven’t started the Game Of Thrones book at all just yet. Just over a month ago, when my fiance and I were in town shopping, we visited Poundland. In here I found 3 colouring books at £1 each. I just couldn’t resist. They were Art of Wonders collection and each book was designed around a specific theme. There was Living Wonders which is full of animals, Floral Wonders which is obviously full of floral patterns and Kaleidoscope Wonders which is full of a variety of symmetrical patterns. I have managed to find links to them on Amazon. While I was browsing the Internet for some things from Todd McFarlane for my fiance, I came across a comic book news article about the brand new Spawn colouring book that had been released a couple of days prior. If you don’t know Todd McFarlane, he is a comic book creator and artist known for his comic books like Spawn. My fiance has always been a fan of his work. The Amazon link provided in the article was to Amazon.com so I searched for it on Amazon UK while browsing the USA Amazon for other colouring books similar to Spawn. I managed to buy the Spawn Colouring Book along with a DC Batman: Mad Love featuring Harley Quinn Colouring Book and the Candy Crush Colouring Book. 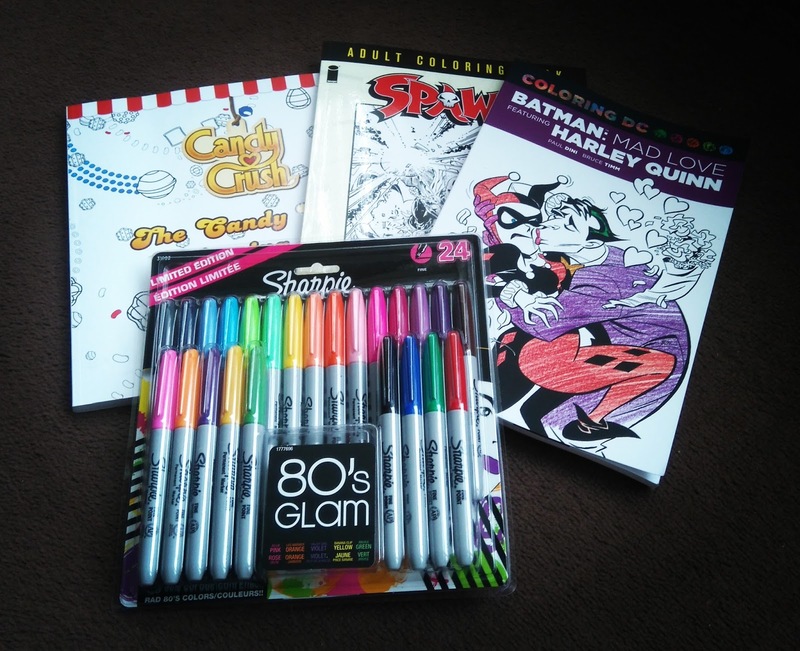 I also decided on a pack of limited edition 80’s Glam Sharpies. I actually bought this from a book seller on Amazon, not Amazon themselves. It cost me £5.73 from the seller, Book Depository. It is currently at a price of £10.98 on Amazon. My fiance and I both love Harley Quinn and the Joker. It’s an inside joke for us that he is the Joker and I am Harley Quinn. I bought this book from Amazon at a price of £11.38. It is currently still for sale at that same price, and it’s RRP is £11.99. I found myself quickly getting addicted to the Candy Crush games, so when I spotted the Candy Crush Colouring Book I just had to buy it. I thought it would be fun to colour in the candy and characters from the games. It’s RRP is £9.99 and I bought it from Amazon at a cost of £5.58. It is currently selling at £4.99. I had spotted someone post about these on Facebook and thought the colours were brilliant. I decided to look for buying me a set. I bought these from Amazon at a price of £8.09, with their RRP being £20.84! They are currently on sale at £9.99. That may sound strange, using colouring books as a way of helping my health, but what I am about to tell you actually really worked for me. Do you suffer from asthma but can’t seem to relax to ease your symptoms? That is one of my main problems, not being able to relax which then accentuates my symptoms. There are times that I have really bad days and they are the days that I find difficult to relax through. Some people say that colouring isn’t relaxing and shouldn’t be seen as some kind of therapy…I disagree. When I can feel problems starting with my asthma, I reach for my colouring books. They help keep me relaxed, giving my body and lungs a chance to relax and easing any symptoms that are arising. They give you focus away from any troubles you are having, helping you relieve stress and relax. 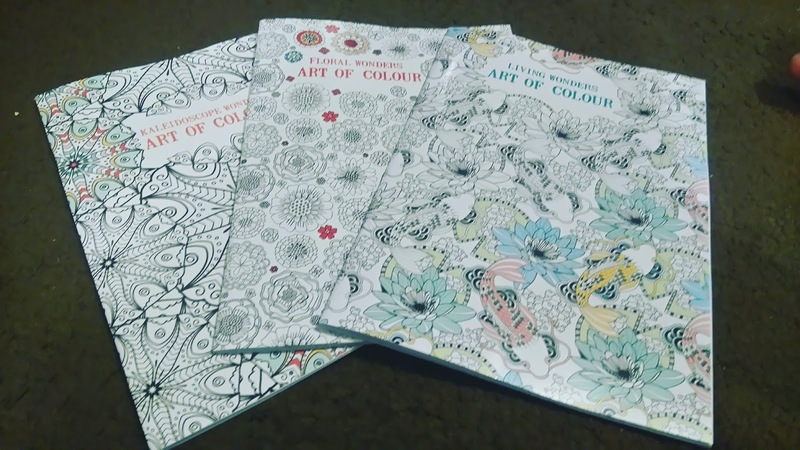 They have helped me a lot in the short time that I have been colouring in these adult colouring books. If you have a really good think about it, when was the most carefree, least stressful part of your life? Childhood, right? Don’t you just wish you could travel back to your childhood sometimes, just to escape the troubles and stress of adulthood? I know I do. Colouring books are like travelling back in time to your childhood for a short time. Not forgetting how it is exercising your creative mind. Do you use adult colouring books? What are your opinions on them being used as a kind of therapy? Have they helped you? I’d love to hear from you. Next Post I’m In The Band…!